It wouldn't seem like there's that big of a difference between getting a No. 1 seed or a No. 2 in the NCAA Tournament, but it's important to note that a No. 1 has never lost in the first round and a handful of No. 2s have. I mention this because Michigan State's chances of getting a No. 1 might have been rather tough had the Spartans lost at Northwestern on Saturday. Sure looked like they were going to, down 43-16 in the first half. Yet amazingly, MSU rallied for a 65-60 comeback win. The Wildcats missed 17 straight shots at one point in the second half. It was the largest comeback win in Big Ten history and, according to Ken Pomeroy, tied for the largest comeback anywhere this decade and equaled the fifth-largest comeback in NCAA history. Why do I think Sparty is on letdown alert Tuesday vs. Illinois? Big East game at 7 p.m. ET on Fox Sports 1. Both these teams seem to have comfortable spots as NCAA Tournament at-large teams, although both are conceivably good enough to win the Big East Tournament. The Bluejays have alternated wins and losses over their past six, coming off a 90-86 home defeat to Marquette on Saturday. Creighton was up 16 points, but when Marquette switched to a 2-3 zone the wheels came off. MU was able to rally even though the Big East's second-leading scorer, Markus Howard, went down with an undisclosed injury late in the first half. Khyri Thomas scored a career-high 26 points on 11 of 17 shooting to lead Creighton. Butler was trending toward the bubble on a three-game losing streak but snapped that with a 69-54 home win over Providence on Saturday. The Friars shot just 5-for-32 in the second half. This is Butler's home finale and the Senior Night. The team's best player, Kelan Martin, will be among those honored. He's third in the Big East in scoring at 20.7 ppg. Creighton's Marcus Foster is No. 4 at 19.8 ppg. Creighton looks for the season sweep as it beat visiting Butler on Jan. 9, 85-74. Foster scored 21 of his 23 points in the first half as the Jays took a 49-32 lead to the break. Martin Krampelj added 14 points and 14 rebounds. Martin had just two first-half points and finished with 10 to go with six turnovers. The Bulldogs had a 37-32 rebounding advantage but attempted just nine free throws. Key trends: The Blue Jays are 0-5 against the spread in their past five Big East games. The Bulldogs are 0-5 ATS in their past five on Tuesday. The Jays are 6-1 ATS in the past seven meetings. Big Ten Network game at 9 p.m. ET. Right now, Indiana's not an NCAA Tournament team at 16-12 overall and 9-7 in the Big Ten, but the Hoosiers are getting closer on a four-game winning streak, albeit against the conference's four worst teams. It was 84-82 at Iowa on Saturday. Robert Johnson tied a school record with nine made 3-pointers, setting the Carver-Hawkeye Arena record, and finished with a game-high 29 points. Indiana has surpassed its Big Ten victory total from a year ago and ensured itself at least a .500 finish in conference play. In the most recent ESPN bracketology, Nebraska was listed among the "First Four Out." The Cornhuskers didn't help their cause by having a six-game winning streak snapped Sunday at a terrible Illinois team. That was NU's last true road game. It if wins here and then Sunday vs. Penn State, it should get a berth. The Big Ten's conference schedule ends earlier than the other Power 5 conferences because the conference tournament is at Madison Square Garden and had to be moved up a week as the Big East's is also there. Key trends: The Hoosiers have covered five straight games. The Cornhuskers have covered their past six on Tuesday. The road team is 4-1 ATS in the past five meetings. SEC game at 9 p.m. ET on ESPN. Is Kentucky fixed? 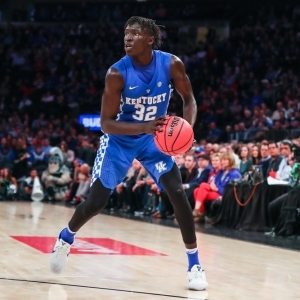 Not sure I would go that far yet, but the Cats ended the first four-game losing streak of the John Calipari Era on Saturday with an 81-71 home win over Alabama. Kentucky dominated on the boards by outrebounding the Tide 44-27, which resulted in 20 second-chance points. The Cats had more offensive rebounds (20) than Alabama had defensive (18). It was the first time that UK "won" both halves since crushing Louisville on Dec. 19. Arkansas is currently projected as a No. 10 seed in the NCAA Tournament. It won a fourth straight game Saturday, knocking off No. 21 Texas A&M, 94-75. Star freshman Daniel Gifford had 18 points on 7-for-8 shooting. He's shooting 70.7 percent from the field over the past five games and 62.3 percent on the season. The Hogs are 14-1 at home this season with a 17.1-point average margin of victory. It's the only scheduled meeting between these teams and the penultimate home game for the Hogs - they host likely SEC regular-season champion Auburn next Tuesday. Last year, Kentucky trounced Arkansas in the one regular-season meeting and in the SEC Tournament championship game. This UK team is nothing like that one, however. Arkansas fell to 1-6 in the SEC title game all-time. Key trends: UK is 1-5 ATS in its past six overall. Arkansas is 4-0 ATS in its past four. The Cats are 5-0 ATS in the past five meetings. Get free picks from any Doc's Sports handicapper - there is no obligation for this offer and no credit card required. Just sign up for an account, and you can use the $60 in free picks for any Doc's Sports expert handicapper and any sport. Get $60 worth of premium members' picks free .